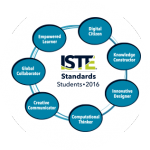 Yesterday we had a very successful “first look” at the ISTE Standards for Students here at ICS Addis Ababa. Follow the link below to read more about the activities in our introductory session and have a look at the data we collected at the end. Our preliminary gap analysis shows that we are already well on our way to curricular alignment!